While many stores encourage shoppers to use reusable grocery sacks, most homes still have an overabundance of plastic shopping bags. Some of these bags are attractive, especially those scored around holidays. Plastic bags can be fused together to make a sturdy fabric-like material that can be used in nearly any sewing project. Reusable grocery bags and even clothing items can be fashioned. The handles and bottom seam of the plastic bag are cut off and the bag is turned inside out so any printing on it doesn't come in contact with the hot iron, which will cause it to bleed. The bags are layered 6 to 8 inches deep. Large pieces of fabric can be made by overlapping the edges of two stacks by 2 or 3 inches. The layers of bags are slid between two sheets of parchment paper and then ironed on high for 15 seconds on the entire surface of the bag. The stack is flipped over and ironed again. Remove the parchment paper and the fabric is ready to use. Beaded jewelry is always in fashion, and every bead lover knows how easy it is to overspend on new supplies. 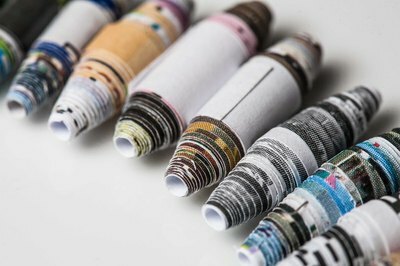 Recycled paper can be used to make nearly any style of bead. The finished pieces look like wooden or clay beads and can be painted in high-gloss paints to give them a nearly glass-like appearance. 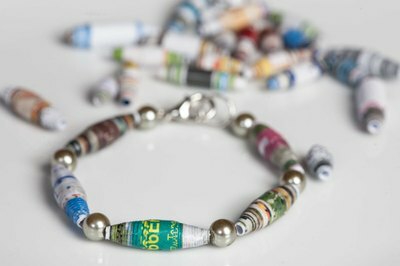 Beads are made from any sort of light to medium weight paper, such as old magazines, newspapers or junk mail. The first method consists of cutting 3-by-1 inch strips. The width can be altered to make different sized beads and the strips can be cut into long triangles or other shapes to alter the finished design. They are rolled around a nail and sealed with glue. Once slipped from the nail they can be painted or varnished before using. The second style uses paper pulp. Paper is torn into small pieces, less than 1-inch square. It is soaked in just enough warm water to cover for a few hours, then blended in a blender on high until it is a thick pulp. The beads are then formed the same way clay beads are and holes are poked through them with a thick needle or nail. After they dry hard they can be painted and sealed. Old clothes that are too stained or torn to be donated can be turned into beautiful artisan quilts. Baby and childhood clothing usually has a few good squares in it that can be cut out and saved. Quilts made from clothing like this often work better than photographs to bring back memories of the past. Old comforters and pillows can be opened up and the batting removed to stuff the quilts. 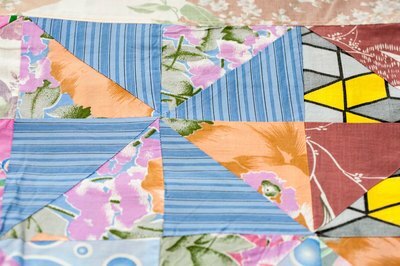 An old mismatched flat sheet can be used as the back of the quilt. The trick to making an attractive quilt from scraps is to choose a simple design with one strong neutral color, such as black or brown, or even a denim fabric. The other squares can be from a variety of colors that are different, but do not clash. 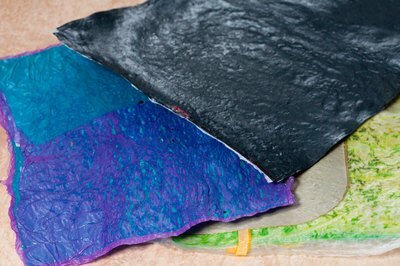 Another way is to choose recycled fabric that are shades of the same color, but have contrasting patterns.